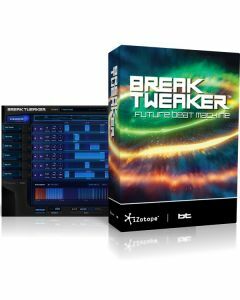 Designed by BT and developed by iZotope, BreakTweaker is not just a drum machine: it's a drum sculpting and beat sequencing machine that blurs the line between rhythm and melody. Give your beats an evolving depth that gets better the longer they play. Use rhythmic slicing to drive everything from pitched melodic lines to sweeping rhythmic concoctions. Top it all off with the best drum sample library in existence, curated by BT, iZotope, and top producers today. Explore a new era of rhythmic possibilities with this forward-thinking and forward-sounding instrument. Assemble pattern-based beats in the Sequencer, which features six tracks for layering your sounds. The Sequencer can store up to 24 different step patterns, launchable via MIDI for on-the fly remixing. Design beats that evolve over time with BreakTweaker’s advanced isorhythmic step sequencing, which makes it possible for each track to have a unique tempo and step length. Sculpt new drum sounds and textures with the Generator. This powerful drum synthesis module defines the sounds for each Sequencer track. The Generator supports morphing wavetable synthesis or one-shot sample loading, polished off with dual-stage distortions and vintage-modeled filters. Four LFOs with unique wavetable shapes, and four Envelopes allow vast modulation possibilities for almost every single Generator parameter. As a bonus, every Sequencer track supports up to three Generators for developing even deeper sonic complexity. Once you’ve perfected the ultimate set of drum sounds and sequenced your patterns, it’s time for a whole new method of sound design. Enter the MicroEdit Engine. A “MicroEdit” is the division of a single step within your pattern into potentially thousands of slices. These slices can then be contoured and shaped to create harmonic, pitched, and rhythmic effects, resulting in new textures that add that extra spice to an evolving beat. By pushing the limits of the brain’s ability to perceive sound, the MicroEdit Engine blurs the line between rhythm and pitch, inspiring beats you’ve never heard before. Bringing sounds, patterns, and MicroEdits together into mind-boggling beats, the BreakTweaker Factory Library comes with over 80 global presets that are ready to kickstart your next project. The Factory Library also features over 2 GB of royalty-free sample content designed by electronic production pros. Specializing in a wide variety of percussive sounds, sample categories range from studio essentials like “Kick” and “Snare” to intriguing possibilities like “Glitch” and “Film”. â€¨PLUS: Expand your sonic palette with BreakTweaker’s add-on Expansion libraries, suited to a variety of production styles. Experience analog punch with Vintage Machines, rhythmic tension and release with Cinematic Textures, industry-defining percussion with Kicks & Snares by Beatport Sounds, and the crisp, clean hits of Modern Grooves by Black Octopus. Manipulate audio at a molecular level: Reinvent any beat by controlling pitch, rhythm, and texture at the finest resolution on the market. Experiment with stunning content: Explore a full range of presets, drum samples, and wavetables designed by today's top musicians and DJs, including BT. Invent completely new rhythms: Create complex polyrhythmic lines with unique isorhythm and playback speed settings. Craft the perfect drum sound: Blend drum samples with robust synthesizer features to create sounds that are the best of both worlds. Take control of your beats: Easily trigger and sequence complex patterns and samples using any MIDI controller. Plug-in formats: AAX (Pro Tools 11-12), RTAS (Pro Tools 7.4-10), VST and VST 3, Audio Unit.